The AVerMedia EZMaker USB SDK is a USB video capture device with both S-Video and composite inputs. The accompanying software development kit provides frequently used functions to help developers and system integrators complete their tasks easily and efficiently. Even better, it is also compatible with major programming languages such as Visual C++ and Visual Basic. 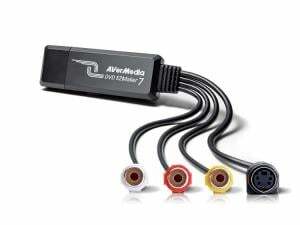 The AVerMedia EZMaker USB SDK allows you to capture true color video sources and images from any type of analog video equipment through S-Video/composite video inputs. Its portability makes it the best solution for mobile applications such as mobile monitoring and analysis. The enclosed SDK provides a complete tool kit to develop software via various programming languages. You can utilize the API to call up the appropriate functions and libraries in our SDK. It can help you to reduce noise, downscale frame rates, overlay a second video over the current one, adjust color or de-interlace. Even better, it is also compatible with major programming languages like Visual C++ and Visual Basic! The AVerMedia EZMaker USB SDK provides users with a powerful set of API in DLL modules for more convenient and efficient development experiences, such as the option of capturing and previewing content in a video window. Users can also add customized text, dates and timestamps to a video. As the leading expert of frame grabber solutions worldwide, AVerMedia now offers Linux driver and OpenCV integration to support C353/CM313B/C351/C039P on NVIDIA TK1/TX1 platforms. The benefit of using AVerMedia C353/CM313B/C351/C039P on NVIDIA TK1/TX1 platforms is to enable the application developers to acquire video feeds from many other kinds of cameras and/or video devices through HDMI, VGA, SDI, and Composite video interfaces, which are very much suitable for the applications of robotics, UAV (i.e. drone), medical image, UGV, surveillance, AOI, and in-vehicle. Operating Environment Temperature: 0 to +45 ? Storage Environment Temperature: -30 to +65 ?